For us, sustainability is as much about protecting the health and prosperity of family farms as it is about preserving the environment for future generations. That’s why the wheat in every bag of Stone-Buhr All Purpose Flour is sourced directly from a cooperative of Northwest family farms. We’ve come to know these amazing farmers and their families pretty darn well over the years and think you’ll enjoy meeting them too. So every month we will introduce you to a new one. That way you can meet all of the farmers, even the one who grew the wheat in your bag of Stone-Buhr All Purpose Flour. Homesteaded in 1888 by Fred Wagner. His daughter Rose Wagner married Guy D. Fleming and started farming 1928. Their son Jack Fleming married Viola Cline and started farming 1947. Their son Fred Fleming married Vicki Wollweber and started farming 1988. I am looking for SG/CPP to create a sustainable market that I can market 30% to 40% of my crop. I also am looking to establish a foundation for the next generation so they can continue in a profitable manner. Why the change to Sustainable Agriculture? This was the right thing to do for the future of this farm. The defining moment was this year during a heavy rain event when my neighbor's ground was washing away and mine stayed in place. This neighbor is an excellent conservation farmer but his best effort could not duplicate a direct seed system for erosion control. What have you learned since transitioning? As I mature in the no-till I become more a convert in the story of developing a living health composite type soil environment to grow my crops. 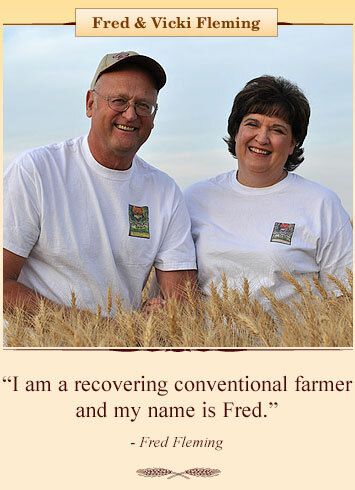 (There is truth in my statement "I am a recovering conventional farmer and my name is Fred.") This then allows me to market my crops in a socially responsible manner that is changing an eco-system. I love the feeling of walking into a bakery and knowing my wheat is being used.